As some or all of you know by now, I had the privilege of attending the Open Document Format summit last Friday in Westchester. As has been well documented by some of the other attendees such as Andy Updegrove (whose notes on the MA hearing from last week are not to be missed, incidentally) and Sam Hiser, the summit was an interesting mix of some of the usual ODF suspects (Adobe, IBM, OpenOffice.org & Sun) along with some newcomers like CA, Corel, Google, Nokia, Novell, Oracle, Red Hat & Scalix, not to mention non-vendors such as Adelstein + Hiser, Gesmer Updegrove, OASIS, Open Document Fellowship, & the OSI. Q: Before we begin, why were you there, and what was your role? Do you have any potential conflicts of interest to disclose? A: I didn’t really think to ask this question; my presumption is that I was invited in my capacity as an industry analyst, and more specifically one with an interest in the subject matter. My role was principally as an observer, given that unlike many of the attendees I have no direct stake in an ODF related software product. As for conflicts of interest, I have worked in an advisory capacity on ODF related software products with clients such as IBM and Sun, and of the other participants Adobe is a client. It’s worth nothing noting at this point that Microsoft is also a RedMonk client. Q: Next question – on a high level, what did you think? What was your impression of the Summit? A: Speaking candidly, I can say that it exceeded my expectations. If the standards process is anything to judge by, multi-vendor intiatives of this type have a tendency to get bogged down in a quagmire of individual agendas, corporate positioning, and corporate inertia. While the discussions at times highlighted the distance in strategies amongst the participants (which is to be expected among vendors that are simultaneously cooperating and competing), the forward progress was never in any real jeopardy. Overall, it was a good and productive day. 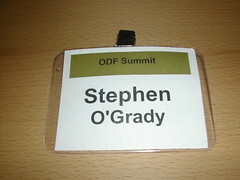 Q: What was the purpose of the Summit – was it to form an ODF Foundation as has been reported? A: Given that I didn’t plan the event, I can’t answer that, but that was not my impression. While some of the initial reports that the session was called with the express purpose of forming an “Open Document Foundation,” the agenda in my mind was far more general. In essence, the convened attendees met to discuss potential opportunities to further collaborate around the format. Certainly there were discussions and debates of potential next steps – creating an organization among them – to further that agenda, but that certainly was not the only reason the attendees were convened. Q: What about the timing – was the event instead convened as a response to the events unfolding in Massachusetts? A: I’m assuming you’re referring to the initial decision in the ETRM to mandate ODF and the subsequent hearing on that decision in which MA Senator Pacheco took a strongly anti-ODF (and from what I’ve read, rather uninformed) position, and again because I didn’t call the event I’m unable to answer that. Was the current process in Massachusetts a topic of discussion? Of course – Peter Quinn gave the keynote for a reason. Massachusetts is a significant battle in the ODF/MSXML landscape; Quinn noted the “global interest” in his decision during his presentation. All that said, however, it’s important to note that Massachusetts is but one front in this conflict. If ODF wins this particular skirmish, it doesn’t win the war – and vice versa. So while the situation unfolding in the Bay State was a subject of great interest and considerable debate, the attendees were just as focused on longer term, post-MA decisions and planning as they were on whether or not the ETRM stands up. Q: What about Microsoft? Was this just a glorified Microsoft-bashing session? A: Not in my view. It’s obvious that some of the attendees have little reason to love Microsoft, but it’s just as true that some of the attendees have little reason to love each other. Nor was it strictly an enemy-of-my-enemy situation; from my perspective, the Summit was primarily oriented towards furthering the ODF as a standard, with implementations of that standard a distant second in priority. During the Q&A with Quinn, I asked him specifically whether or not the rumored ODF support in Microsoft Office via a French third party (should that prove true) would make a difference. His reply was clear: absolutely. Contrary to some of the claims you might have seen, this is about supporting a standard, not a particular product or a vendor. Should Microsoft choose to support that standard, they’d be welcome to bid on MA’s business. Q: Speaking of Quinn, what was your impression of him from the keynote? First, the Commonwealth is far more fragmented and heterogeneous than even the most decentralized organization (that’s government for you). What Quinn is seeking in the ODF, as well in the less heralded portions of the ETRM, is some consistency in implementation – hence the importance of standards. Second, MA has a different level of responsibility to its customers than does, say, Fidelity or GE. This is where the sovereignty arguments made by MA Secretary Kriss in the past come in. Massachusetts had both the first public school and public library in the country, and this history is not lost on Quinn. Overall, I found Quinn distinctly and refreshingly practical in his preference for ODF over the Microsoft alternative. In his words, the MA philosophy was to “commit and act on ‘Open Standards’ and leave the religious Open Source debate at the door.” The decision, as he laid it out, is not particularly complicated or nuanced; it’s simply a preference for standards. That, if anything, is the bias at work. Q: How about the criticism that Quinn and the Open Document Format vendors did not do enough to acknowledge the needs of disabled users? A: Quinn did not dodge this feedback, calling it “fair and balanced.” The excellent Andy Updegrove has more on that here. Quinn did request that the assembled vendors do everything in their power to make this a non-issue, and Sun’s Doug Johnson is promising innovation in just that area. The dynamics of the accessibility situation are in and of themselves interesting, however, because my understanding is that the vendor producing the tool used to make Microsoft Office accessibile via a tightly integrated scripting interface has been less than receptive to overtures from non-Microsoft vendors. That’s worth watching. Q: Did Quinn offer an opinion on what the outcome of the recent Pacheco hearings might be? A: Not as such. All he promised to the potential attendees was that his group would stay the course, and remained committed to the promise of interoperability and choice offered by the ODF standard. Q: What is the wider significance of the Open Document Format, whether in Massachusetts or more broadly? A: Well, let’s take Massachusetts first. The significance there is that it’s a carefully considered but decisive move towards open standards in a realm (office productivity) that has seen little of them to date. As Sun’s Hal Stern put it in some early remarks, we’ve standardized the way that computers talk to each other, as well as the applications that run on those computers, but in an area where users spend hours each day we’ve been almost entirely proprietary. While such a decision in favor of standardization would be of interest even in a medium sized organization, it takes on a new significance considering the importance of Massachusetts in both financial and political terms. If the ODF mandate stands, it could serve as an important precedent for other states that are interested either in a.) the benefits of open standards, b.) greater independence from Microsoft, or c.) both. As mentioned before, however, MA is just one of the states and goverments considering such a move, so it’s important to appreciate that context. It’s my belief that regardless of what happens in Massachusetts, the horse has in some sense left the barn: I expect more such debates in the months and years ahead. On a broader scale, widespread adoption of the ODF could force Microsoft to compete on the technical merits of Office rather than on the control point of the formats it outputs. 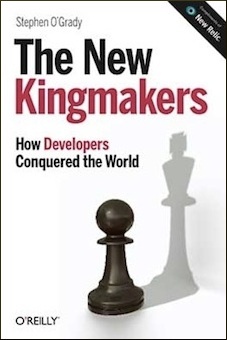 Before I’m accused of being anti-Microsoft – as I have been in previous discussions in this area – I’ll state up front that I believe that should they decide to compete on that basis it’s my belief that they’ll win more often than not. That’s said as someone whose primary office productivity suite is OpenOffice.org. Further, I do give Microsoft credit for opening their formats to an unprecedented degree, this was commendable. All things being equal, however, I’m always going to favor an open standard (i.e. one participated in by multiple parties) over an open format (i.e. one controlled by a single party). In my humble opinion, history has adequately demonstrated that the former is more conducive to innovation than the latter. Compete on implementations, not formats. Q: What emerged in the way of concrete plans or deliverables from the Summit? Anything? A: I’m don’t believe that I’m at liberty to discuss the action items in any great detail, but Andy discusses some of the next steps in his entry here. I can say that the Summit was not simply a bunch of one way lectures; following Quinn’s keynote the attendees were broken into smaller interactive working groups and tasked with looking at different ways to promote and further the ODF. Ultimately, I expect this initial Summit to form the basis for ongoing collaboration between the interested parties in the days ahead. The journey of a thousand miles, etc, etc. Q: Who else should I talk to and/or read if I’m interested in the ODF Summit? A: Just that I think this is a big, big deal, and merits all of the attention it’s getting. Two other quick things – as I mentioned above, if you have questions that I haven’t answered, feel free to send them over. I can’t promise I’ll be able to answer, but I will if I can. Second, if there are other resources or links that you think people should be aware of, please drop in a comment so that folks stopping by later can benefit. Please note that I am under a few restrictions as to what I can discuss. To encourage completely honest and frank discussion, I’ve promised not to get into detailed he said/she said scenarios, or discuss detailed corporate positions without explicity permission to do so. Thanks for attending the ODF Summit. From someone that was there, I feel that your observations are accurate. Jon was pointing out the incorrect word used here. You must have meant to use “noting” but through mis-spelling it turning it into “nothing”. arrived here via David Berlind’s reference.. Thank you for the notes. I think this is an important and interesting development, makes for interesting times.. Who needs SOAP operas ?